and completely re-invents what you know to be possible in a landscaping project. View our past, current, and on-going project below to get inspired. When planning for large grass expanses that are broken up with installs and features, proper edging and attention to detail while designing can make for easier long term maintenance. We know an impeccable, manicured finish is key to your enjoyment of the space – so we take the time to build it right. Every piece of land is different, and every landscape presents new opportunities and challenges and must be properly maintained in order to preserve the value of the investment. Here, we have immaculately maintained a large backyard in the community of Elbow Valley, and kept it lush and extravagantly unique year-round. It even features a gorgeous pond and brook like you wouldn’t see anywhere else in Alberta. When it comes to maintaining a dream landscape, our team can handle any lawn or natural space – the sky’s the limit! As you might have heard us say – acreage landscapes are our specialty. Having a huge area of pristine land to work with opens the doors for almost limitless design possibilities. In this project, you can see how we’ve taken cues from the design of the home itself, and expanded those themes into the yard design, stonework, and woodworking. In the end you have an stunning view, and the perfect yard to make memories with family. BACKYARD MAKEOVER - "Sticking with the yard that had water issues"
This home had water accumulating against the foundation unbeknownst to the homeowner. We were initially consulted on the project, which was to lift, add road crush, and replace the patio, as it had sunken up against the home. After lifting the patio, we noticed a slight damp spot where the back door is located. This area had sunken in after only a few years of living in the home. Commencing with a basic tamping down of the existing area, our machine slowly sank down as though it were in quick sand. The neighbours’ yards on either side of this house’s sloped towards them, and as an area with a lot of water run off from the street, it created somewhat of an anomaly. We needed to excavate to the foundation to better assess the extent of the issue. We came up with a plan to vacate the water from the premises. The home owner was obviously disappointed from having to do all this work, however, realized we could not ignore the issue, nor could we replace the patio as it was and simply walk away. – From excavation to end of line the slope went from around 4’-6″ to 7’ in depth. They say to never judge a book by its cover, but with homes, this is a difficult ask. Reworking a simple front yard into a thoughtfully-designed entryway into one’s home is a task we’re always willing to undertake. (Nothing says great design has to simply exist inside the home!) Now this client’s front yard is both inviting and functional in a way that only our team knows how to implement. Renaissance Landscapes Inc loves a challenge, and loves the opportunity to build something that benefits the community at large! Here, we developed attractive, functional, and eye-catching community garden plots for the Tuscany community to use and grow into. Our expertise are not simply limited to homes and yards – Renaissance Landscapes can tackle almost any landscaping task you can imagine. For this job, Bowness Highschool was hoping to take some of the trampled, sloped grass from below their announcement board, and refine it into a space where students and faculty alike could congregate and wait for the bus without having to stand on anything that needed to grow. 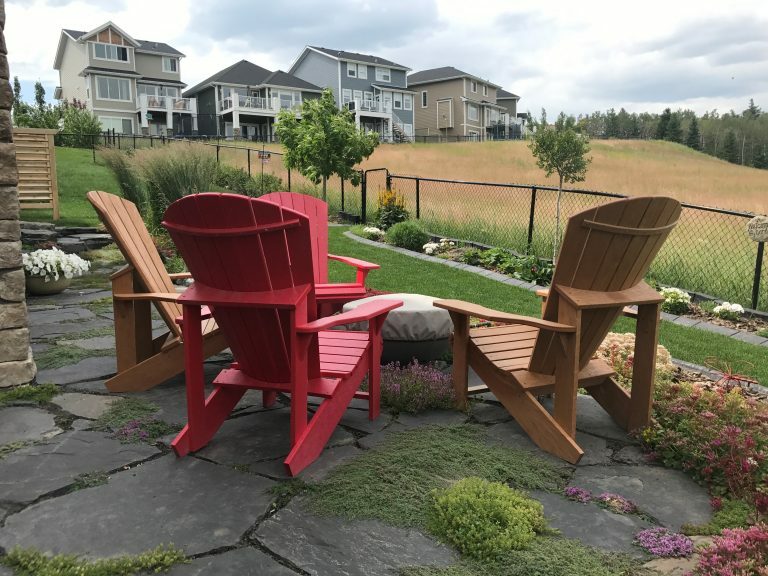 This client was looking to turn their backyard from a simple grassy area where a barbecue sits rusting, and a ball might occasionally get kicked around, into a comfortable and specially-tailored area for outdoor entertaining. Now, when the weather allows, it’s basically a second family room. Many people want to take advantage of their outdoor space to create a personal oasis. However, proper planning is key to such a design, or your oasis can quickly become an ongoing “make work” project. This custom space in Ranchlands was transormed by our team from a ho-hum backyard into a personal oasis where hummingbirds, children, and mythical creatures alike take solace. Many condo boards and HOA’s are interested in beautifying the (often limited) natural space around their buildings’ sides and front entrance. Though often lacking in a traditional “yard” space, there is still plenty of opportunity to beautify and make useable space from dead and stomped-over natural areas. Here, we tackled one such problem, increasing the value of the homes in the unit without even touching them.